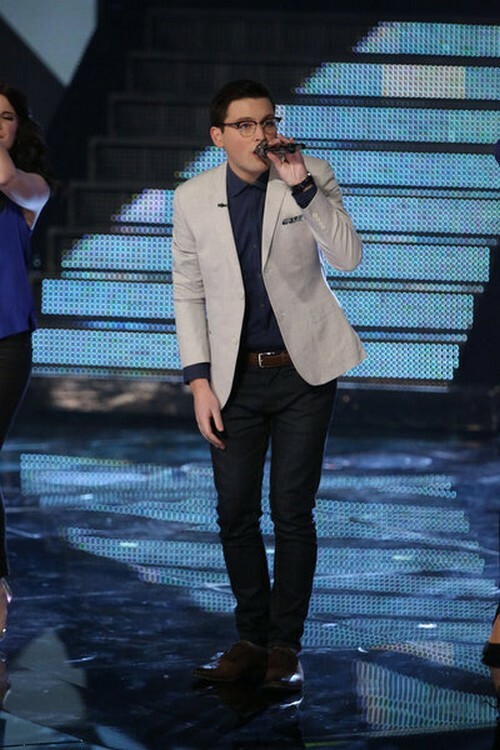 James Wolpert took the stage tonight on THE VOICE for his Top 12 video performance. James sang “Mr. Brightside” by The Killers. Tonight’s show the remaining artists from each coach, Christina Aguilera, Adam Levine, CeeLo Green and Blake Shelton team performed live for America’s vote and the chance to move on to the Top 10. Judges Comments: Adam say that ever single second of that song was the most dynamic yet controlled performance he has ever seen, he turned into a rock star in front of their eyes and loved it so much. Christina says it was really nice and is proud of Jame; she is impressed with his growth and the high note he had was just perfect but felt nervous at first but is glad how great it went. CeeLo says he loved the stage presence and the way he performed was just amazing. James Wolpert who is on Team Adam Levine’s team talked about his biggest musical inspirations, check it out [CLICK HERE] If you want to keep James Wolpert don’t forget to vote for him. Check out the video below and let us know what you thought of his performance? Was it enough to send James through to the top 10? Sound out in the comments below and let us know your thoughts.